For a soft and sophisticated style and see-through effect, a side-mounted glass balustrade is very effective. Our range of glass balustrades, enable you to have a safe and secure balustrade with the brilliance of a nearly uninterrupted view. The side mounted balustrade can work with both Frameless & Semi Frameless Glass fencing options. The glass balustrades can be supported by either 316 Marine Grade stainless steel, Powder Coated or Anodized treated aluminum with a variety of finishes available. Each method of balustrade fixing delivers its own unique advantages. Side mounted frameless glass balustrades are mounted to the side of the glass using 316 Marine grade stainless steel pins too. 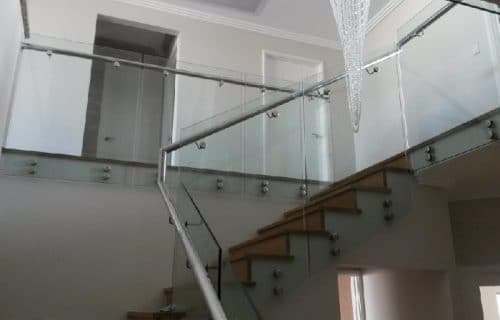 Frameless glass balustrading normally refers to having no surrounding material (stainless steel or aluminium) on at least three of the four sides of each panel. 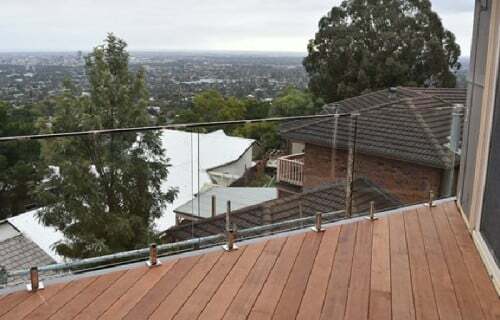 Australian standards require a top rail on every balustrade protecting a fall of greater than 1 metre (1000mm). Thus a top rail sits on top of the balustrading or it can be an offset rail attached to the inside of the glass. The glass panels are often supported by spigots (or mini posts). The glass we use is 12mm clear toughened glass and panels spans are up to 1500mm wide, depending on the length of run. Semi frameless balustrading has a post between each panel and a top rail attached to the posts. The glass panel sit between each post with an air gap of 50 – 80mm between the top rail and glass and glass to deck. Glass can be mounted directly into the posts or suspended between four glass clamps. Posts can be flat bar (10mm x 50mm), round, square or rectangular. They can be made from stainless steel, powder coated aluminium or powder coated steel. Call for a FREE no obligation quote today on 0418 843 085!